This book just won a 2009 Newbery Honor Award, and justifiably so. Mibs Beaumont is about to turn 13, and in her family it means that she will "inherit" some skill that will need to be managed. Her oldest brother was able to create electricity when he turned 13 - her other brother disrupted the weather by causing hurricanes. After a car accident leaves her beloved Poppa unconscious in a hospital, Mibs hopes that her new savvy will help him wake up. With that belief, she stows away on a pink bus she thinks is heading toward the hospital 90 miles away. Driven by a pink bible salesman and accompanied by two brothers, two church friends and a waitress they meet along the way, a wild chain of events begins that will affect the lives of the entire group. What will Mibs' savvy be? Will she be able to save her father? This story is very well written and after a very suspenseful and chaotic ride though Kansaska-Nebransas, comes to a satisfying conclusion. Readers in grades 5-9 will enjoy this story. 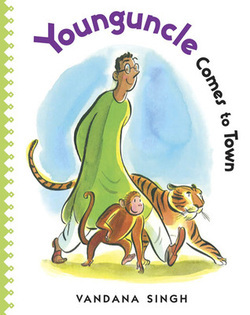 Set in India, this is a collection of adventures experienced by Younguncle (the name he has been called for as long as he can remember) that he brings back to tell his nieces and nephew. He has recently come to live with his brother's family and promises the children that he will return with another tale anytime he leaves. Younguncle is clever and manages to outwit his foes in each humorous story, never being discovered as the one who has saved the day. Filled with many references of India, including place names, foods, and clothing, makes this a nice introduction to the culture. The strange words raise the reading level, but the large text makes this appealing to reluctant readers. 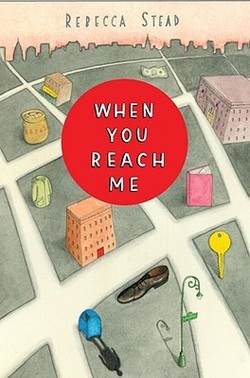 May also be used as a read-aloud for children through grade 6. 11-year-old Antonia MacPherson, known as Ant to her friends, has told her art teacher, Just Carole, that she's adopted. She's traded report cards with her friend Harrison so that he gets her good grades and she gets his bad ones. She's taken her elderly dog Pistachio to vets and left false addresses so she won't get a bill. She's told her parents that there is no room at the Math-a-thon for them to stay and watch, even though she is really good at math. She lies about everything. "Liar, liar, Ant's on fire," her younger sister "Katherine the Great" jeers. Ant is sure that her mother loves Katherine and her older sister "Your Highness Elizabeth" more than her, and she keeps a journal for her "real" parents for when they come to get her explaining her side of all her lies, knowing they will understand why she told them. When Just Carole offers to take Ant and Harrison to the zoo to work as zoo teens, Ant is excited. But she lies then too, leading to near catastrophe. And when Ant's father announces they will move, again, across the country, Ant has had all she can take. 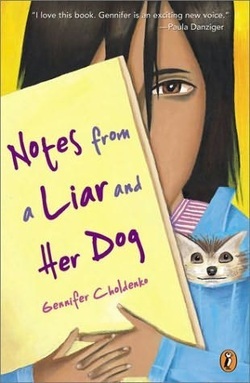 This book is recommended for readers in grades 4-8 who enjoy realistic stories and to those who feel misunderstood by their parents. This is also an excellent book to listen to on CD. 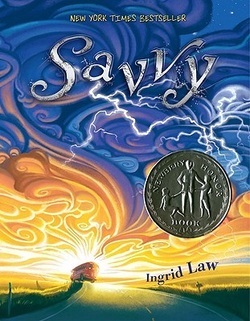 Winner of the 2010 Newbery Award. It was wonderful to see how the pieces of this story all fit together. It becomes clear that Miranda is writing this story to the person who has left her notes, explaining so perfectly her changing relationships with the people around her, and capturing the details of 1979 so well. The discussions with classmate Marcus about time-travel are especially interesting, and the inclusion of "the laughing man", a seemingly crazy but harmless homeless man who stays by the mailbox near their apartment building, gives dimension to this clever novel. I could completely relate to Miranda's love of "A Wrinkle in Time". It was my favorite book at her age as well. Maybe it still is. Highly recommended. This is also good on CD. This is a mystery and science fiction story that will want to be read more than once, to understand the significance of the clues. This book received a starred review in School Library Journal. Highly recommended for grades 5-8. 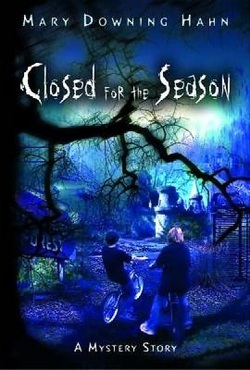 Logan's family unknowingly move into the "murder house", where old Mrs. Donaldson was found dead at the bottom of the basement stairs of her ransacked house. Next-door neighbor Arthur wants to find out who not only killed her, but attacked her dog Bear as well. The middle-schoolers become fast friends and, while giving Logan a tour of the town and filling him in on everyone living there, the two begin to research the murder, which involves embezzlement of money from a recently closed amusement park. They may be on the right track, but must find a missing briefcase with the murderer's initials on it before bulldozers arrive to tear the amusement park down to build a shopping development. People are not always as they appear and friendships are tested in the fast-paced mystery. The characters of Logan and Arthur are well developed, and I have to love that they are avid readers and like to visit the library, but other characters are rather one-dimensional. Boys in grades 4-7 will enjoy this. 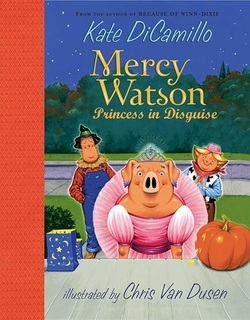 Mrs. Watson decides that Mercy should dress up for Halloween, and with the promise of treats (Mercy imagines toast with lots of butter), she agrees to wear the princess tutu and tiara treat-or-treating. On Halloween night, Mercy stops at the house of the Lincoln sisters, Baby and Eugenia. Eugenia does not think that a pig should be trick-or-treating or dress like a princess, and so slams the door on Mercy (who wonders where her toast is). But Baby is more simpathetic and offers candy through the back door. Mercy enjoys the Butter Barrel candy until it seems that the Lincoln's cat General Washington wants to play chase. Mercy runs out of the house after the cat, with Mr. and Mrs. Watson and the Lincoln sisters following. In what appears to be a Halloween parade to the neighborhood children, Stella and Frank join the fun. Fun until General Washington gets stuck in a tree and the fire department must be dispatched to rescue him. Will Mercy ever get her treats? This is Halloween fun for readers in grades K-3. Vivid color illustrations complement the sparse text. Anne Marie wanted a child so badly, so she went to a witch to ask for one, even though she knew that what she asked for and what the witch gave her would probably not be the same thing. But she was desperate. And despite the fact that what she got was a teeny, tiny girl, Anne Marie loved her and named her Thumbelina. And she protected Thumbelina, although Thumbelina couldn't always understand why. After convincing Anne Marie to let her sleep in her walnut shell bed on the porch one night (only after much begging), Thumbelina began an adventure that helped her begin to understand her mother's warnings. 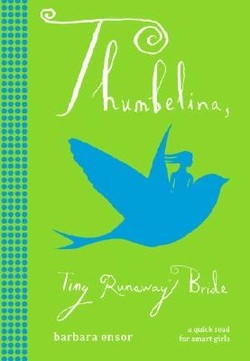 For lovers of fairytales, this is a detailed account of Thumbelina's story, including entries from her diary. Pictures cut from black paper illustrate this large print book. Athought the vocabulary is leveled for middle school readers, it will be of interest to readers in grades 3-5 and younger children who have it read aloud to them. In tribute to this author's recent death, a man who thought children should have interesting non-fiction books to read long before it was popular, here is only one of his over 80 books published in the areas of history, biography, and social reform. 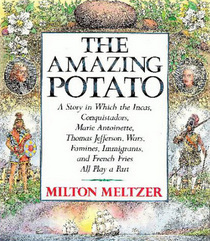 With the subtitle, "A Story in Which the Incas, Conquistadors, Marie Antoinette, Thomas Jefferson, Wars, Famines, Immigrants, and French Fries All Play a Part", Meltzer only hints at the amazing facts about the potato in which no one would guess. Did you know that the potato is part of the nightshade family, the same as tobacco? Or that sweet potatoes are part of the morning glory family and not really a potato at all? Beginning with the Incas in Peru, (where potatoes had been harvested and preserved for many years before the Spaniards came to the New World and brought them back to Europe), to modern day uses and benefits of the potato, this book is packed with fun and educational information useful for school reports. Doing a report on Thomas Jefferson? No problem. Throw in a tidbit about how, in his love of all things French, he brought the potato back from Europe and helped popularize it to Americans by making various yummy dishes served at the White House, including pommes frites (french fries). The book also includes black and white photographs, index, and bibiography. If after reading this you decide you are really interested in potatoes and want to read something else, try Susan Campbell Bartoletti'sBlack Potatoes, the Story of the Great Irish Famine,1845-1850. Recommended for grades 4-8. 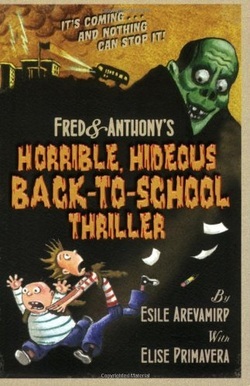 This is the fourth book in Fred & Anthony's series of books, and boys will not be able to get enough of them. The boys return to their school, a place they love because of the Pez and Chex Mix served at lunch in their junk food cafeteria, their donut-loving coach, and their teachers from the senior citizens home who teach bingo, shuffleboard, and crafts. But healthy food is suddenly being served in the cafeteria, and a new kid at school is receiving awards and recognition, while getting Fred & Anthony into trouble. They begin to think that he may be from the Netherworld, where they have found themselves during their last three adventures. Will they have to return there to set things right? In the same vain as Captain Underpants, the books are formatted with text and lots of cartoonish illustrations. It is not necessary to read these books in order since much of the history is recapped, however, readers will probably like them better if read in order just because they will recognize the characters from the past adventures. Full of toilet humor and silliness children, but especially boys in grades 3-5, will find these wacky books fun to pour over. 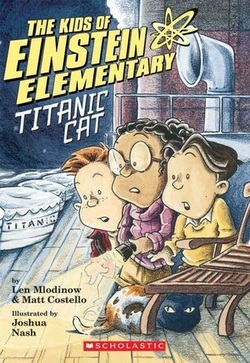 This second adventure in The Kids Of Einstein Elementary time-travel series takes place on the day the Titanic sinks in 1912. Kenny, Jose, and Steffi plan to return to visit baby dinosaur Sammy from their first adventure, but don't notice the controls in the time machine have been changed until it is too late. On board the Titanic they meet Emma and warn her that the ship will sink that night. Emma and her mother must get on a lifeboat fast. But Emma won't go until she can find her kitten Mittens first. Can the children help find the hiding kitten and still return to their time machine before the ship sinks? Children in the early elementary grades will enjoy this page-turner. Black and white illustrations accompany the text. Also includes explanations for mathematical concepts including probability, combination locks, odds, fair games, and timing. Kids in grades 2 and 3 will be able to read this themselves, while younger children will enjoy having it read aloud. When brothers Marty and Will are told by their parents that they will spend three days a week at the library, they are worried. 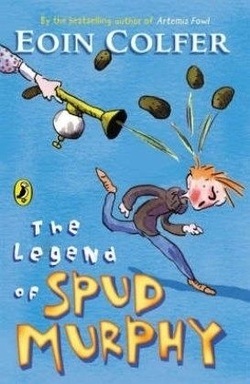 All the kids know not to get in the way of the gas-powered, potato gun-toting librarian known as Spud Murphy. You'd get shot by a potato for breaking the no noise rule, or for moving off the carpet in front of the book shelf holding the junior books for children. On their first day, the brothers also learn about the rubber stamps held firmly in place in her waist belt... Boys in grades 2-4 are going to love this series of adventures about the Woodman brothers. Humorous black and white illustrations add to the hilarity of the story. This is a good series for those that want something in addition to the Magic Tree House series. 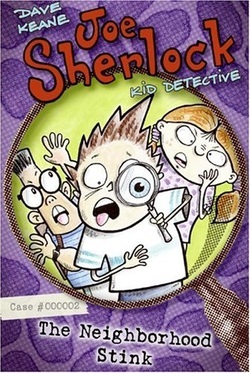 This is the 2nd book in the Joe Sherlock series in which fourth grader Joe is hired to solve a mystery. This time, uptight neighbor Mrs. Fefferland needs to find the culprit depositing multiple piles of poo in her maticulously cared-for fenced front yard. Will he be able to solve it before dinner? These are short and fun books that will appeal to boys in early elementary grades. The reading level is higher than would be expected for the large print and black-and-white illustrated format, but many words and concepts are defined throughout. Boys will appreciate the silliness and embarrasing situations presented. Good for fans of the Captain Underpants books. Books in the series don't need to be read in order. These would be especially good for reluctant readers in grades 4 and 5. This is a magical tale about an orphaned boy named Peter who is being trained as a soldier, brave and true by his guardian Vilna Lutz, who saw Peter’s father die in battle, and mother and sister die in childbirth. Sent to buy fish at the market one day, Peter defies his guardian and uses his coin on a fortune teller instead, where he is able to have one question and one question only answered. His question concerns his sister. It’s just that he’s been having dreams about having held her as a baby. Does she still live? The answer he receives makes no sense. Yes, the fortune teller replies. Your sister lives. The elephant will lead you to her. Peter is confused. Vilna Lutz has always said that she is dead. And, there are no elephants. 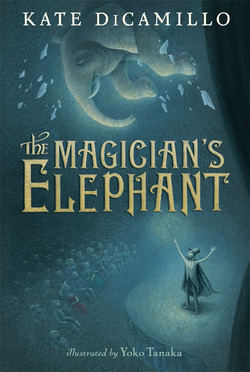 In the same storyteller style used in The Tale of Desperaux, and the beautiful language we’ve come to expect from Kate DiCamillo, this fable about truth, love, belonging and unexpected adventure is recommended for children ages 8-12. Black and white illustrations by Yoko Tanaka add to the atmosphere and character of the story. Being a huge architecture fan, this book instantly caught my eye. Based on the true account of Filippo Brunelleschi, when in 1420 the architect and engineer submitted his plans in response to a contest calling for design entries to build a dome on the Cathedral of Santa Maria del Fiore in Florence, Italy. The problem is one that engineers currently cannot solve - how to support such a large dome that is so high in the air. It seems unsolvable. But Pippo submits a design of which he is confident and is overjoyed when his design is chosen, after having to build a smaller replica to prove that it will work. He is not happy when forced to work with his adversary and biggest heckler Lorenzo, knowing that he will do all the work and Lorenzo will take all the glory. Regardless, he accepts the task. Taking twelve years to complete his dream, Pippo is finally able to rid himself of the hated nickname when his dome becomes a magnificent marvel. Told in picture book format, this story is accessable to readers of all ages. A good introduction to architecture and reinforces the idea that one's ideas are only foolish until they may be realized. A more detailed account of the project is included in the back of the book. 12-year-old Seema moves with her family from India to Iowa City, leaving behind her best friend and cousin Raju and her extended family. 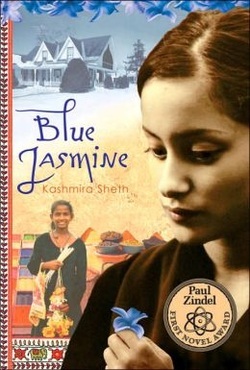 Nervous about fitting in and unable to speak English very well, she attends school and finds that nothing is the same as it was in India. Although she makes friends, she is hounded by a bully, a new girl at school, every single day. She longs for Raju and another classmate who she treated badly in school the previous year. When her grandmother Dadima becomes very ill, the family briefly returns to India where Seema must face her angry cousin who cannot accept the changes in her, and learn the truth about the classmate she never treated very well. This is a quiet story that will appeal in particular to girls ages 10-13. Cultural differences are explored as well as bullying. This author won the Paul Zindel first Novel Award. This is the third book by this author that involves art. Calder, Tommy, and Petra, now in 7th grade, visit an art exhibit of mobiles by Calder's namesake, Alexander Calder, in their home town of Chicago. The exhibit includes "the Calder Game" that encourages visitors to create their own mobile of objects, symbols, or ideas using five parts. When his father goes to England to attend a conference, Calder joins him and is surprised to find a Calder sculpture displayed in the square next to his bed and breakfast. While he enjoys the sculpture, the villagers do not, because it doesn't fit with the history and tradition of Woodstock. Suddenly, both the Calder sculpture and Calder the boy disappear. Tommy and Petra are called to England because of their love of puzzles and playing with ideas and words. Can the Calder Game help them solve the mysteries and bring Calder home? This is a unique book that will get readers thinking about art in a new way. 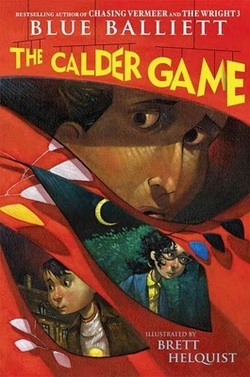 I plan to use it with my Tween book club this summer so we can play the Calder Game too! Suitable for grades 4-8 and those that enjoy mysteries or thinking about new ideas. 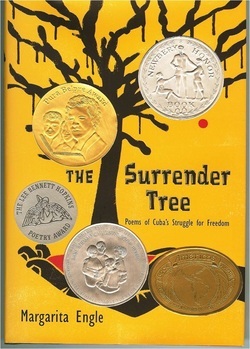 This free verse novel just won a 2009 Newbery Honor Award. I found the story of the three wars between 1868 and 1898 in Cuba fascinating. Ruled by Spain, the rebels on the island of Cuba continually fought to free slaves and become an independent nation. This complex history is cleverly and simply told by Rosa, a nurse, who helps all people who are sick or injured, friend and enemy, by using the native plants. Rosa's story is interspersed with poems from the point of view of her husband Jose, who guards the hospitals and huts and caves where they hide, and a young girl who has survived the reconcentration camp set up by the Spanish to prevent the peasants from growing and providing food for the rebels. Rosa is stalked her entire life by "Lieutenant Death", a Spanish slavehunter whose only goal has become to kill the "witch", even though she healed his injuries when he was young. This is easy-to-read and would interest older students who enjoy historical or political stories. It was a sad realization for me to learn that the US fought the Spanish American War to gain control of Cuba from Spain following the third war in Cuba. A time line is included in the back of the book. This is a tale about love and hate, jealousy and loyalty, promises and betrayal. A pregnant cat is abandoned along the side of the road where she hears the sad songs of a lonely hound dog through the woods. Following the sound, she finds Ranger living in the underneath, a place under the tilting house of Gar Face, a mean and hateful man. 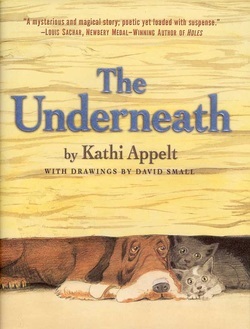 She has two kittens in the underneath and the four become an unlikely family...the dog offering protection and the kittens providing companionship. But they must stay hidden in the underneath. Intertwined with this is a story from a thousand years ago that happened in this same place, when a man and woman fell in love and had a baby girl. The woman, a daughter of Grandmother Mocassin, shed her snake skin to be with the man. The man, shed his feathers to be with the woman. But they may never shed their human skins if they are to remain together. Don't let the cover fool you. This is not a story for young children. Filled with animal abuse and suspense, readers may find the book too disturbing to finish. Justice does prevail with a clever twist at the end. Beautifully written. Suitable for grades 5-8. Here is a story that's stranger than strange. Before we begin you may want to arrange: a blanket, a cushion, a comfortable seat, and maybe some cocoa and something to eat. In Dr. Seuss fashion, this novel of imaginary beasts is told completely in rhyme. No easy task and amazingly successful, kids will gravitate toward this format. They will probably even read it out loud just to hear the sound of it. 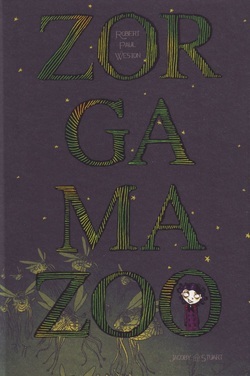 The story is of Katrina Katrell, who along with a self-proclaimed cowardly Zorgle named Morty, is on a quest to discover what has happened to the mysteriously disappeared Zorgles of Zorgamazoo. When they are kidnapped and taken to the moon by a Graylian trying to save those on his planet, Katrina and Morty discover where all the Zorgles are, along with griffins, ogres, sphinxes, and other supposed mythical creatures. This exciting adventure is recommended for kids in grades 2-5 and is an excellent read-aloud for those who cannot yet read.